"First in ten, the endzone, blah-de-blah-de-blah." When people talk football to me, all I hear is what the Peanuts kids heard when adults spoke. My eyes glaze over. I immediately change the subject. Before I married my husband, I asked if he watched football. Had he said yes, I'd have moved on. But I am grateful he only watches when the Cleveland Browns are doing well, which is like 1% of the time. Other than that, he doesn't care if the game is on. Sometimes we get invited to Super Bowl parties. My first question usually is, "Do we have to stay for the entire game?" 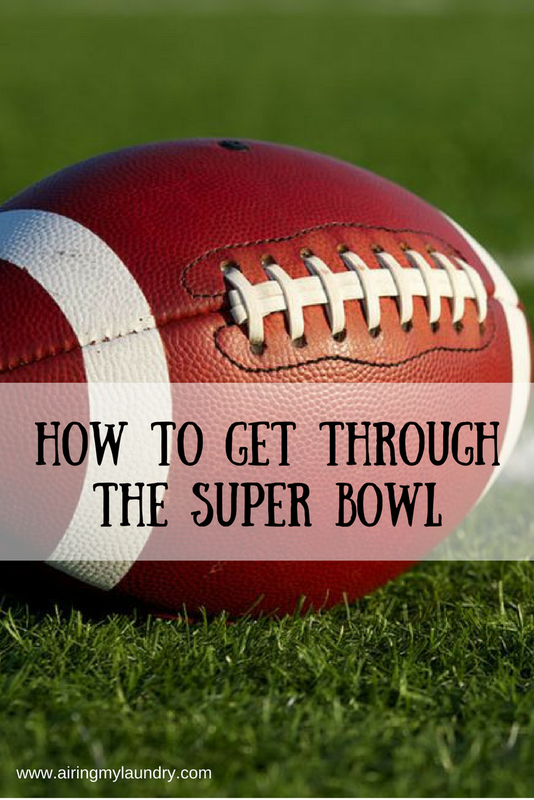 If you're invited to a Super Bowl party, or if your husband watches football and the sport bores you tears, I have tips to get through it all. 1. Bring a book. Seriously. 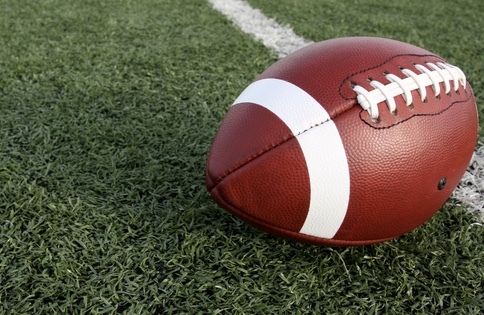 If everyone else is going to watch football and you are not, it isn't rude to read. Make sure you thank the host, but if all eyes are on the screen, read! Or if your husband insists on having people over and all they plan on doing is watching football, read. 2. Pig out. There's usually amazing food at Super Bowl parties. If you stink at cooking like I do, take advantage. Granted, make sure you bring a dish because it's rude to expect the hostess to make everything, unless she insists. Some people actually LIKE to cook, and I forget this at times. Or sometimes people know how terrible I am at cooking and practically beg me not to bring anything. 3. Root for the team everyone else is against. You'll usually spot the man children fairly quickly. Some will even claim you're "bad luck." Remind them it's just a game and to take it down a notch. 4. Enjoy the commercials. Most of them are amusing. Some are stupid and you wonder why money was wasted on it. Some are baffling and you wonder how drunk the person was who came up with it. See: puppymonkeybaby commercial. So will you be watching the Super Bowl? My husband might go to a party, but I've already told him I'm staying home. I love this post! I've used the Peanuts analogy before when trying to explain to people why I don't enjoy sports. When someone tries to explain it to me, I can see their mouths moving, but my brain doesn't accept what they're saying as actual words. And the sound of sports playing in the background is more depressing to me than elevator music. Ugh, yes! I'm glad someone else gets it. Most of my friends actually LIKE sports. Normally I love watching the Superbowl and especially when my Patriots are in it, but this year I am sitting it out. It's a shame that you're not that enthusiastic about football or the super bowl. If you are ever dragged to one, just enjoy the company of others or just the party. The game is just an excuse to party. Oh, trust me, if people want to talk about stuff other than football, I'm all for it. But I went to one party and it was ALL about football, and I wished I had a book. We are having a big football party. Out of everyone only two people really care about watching football. There is a separate room they can go and watch the game. Everyone, well we get together for the great food and conversation. 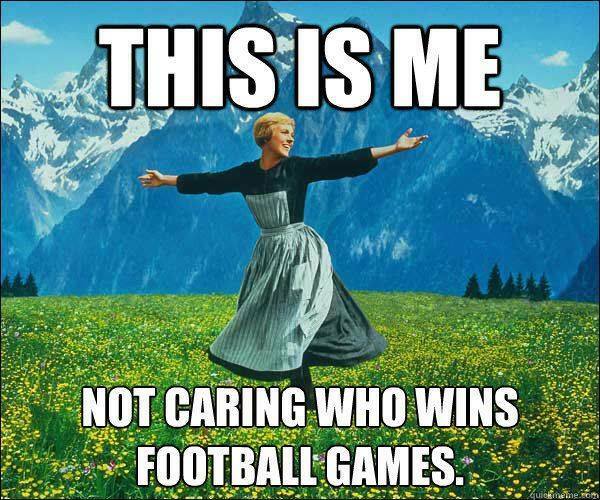 That is me too not caring who wins in ALL sports! Hahaha! Sorry! That means I am totally disconnected. Definitely eating and commercials! This year I'll be traveling during the super bowl! Honestly I could care less about the game itself but it is fun to watch the commercials and hang out with friends. hahaha, I always root for the other team. although in this case, I live in New England AND the other team seems totally obnoxious. So I can't just this one. I can pig out, though! Ha ha, my husband and I are not big football fans at all. We have plans to go over to a friends house for the game this Sunday. There will be a ton of kids running around, yummy food! Also, the commercials are always amazing. I am really excited to see Justin Timberlake's halftime show as well, so there is enough to still make it a fun day. Number three cracked me up! Certainly would be entertaining for the non football fan lol. I happen to be very into football but not into any Superbowl that much unless my tea made it! I watch but I don't get into it full swing. Yes, the super bowl is all about good food for me, too. I also enjoy the commercials and spending time with family & friends. I can't relate because I love football and I LOVE the Super Bowl. The food, the family and friends, the commercials, JT at the halftime show...SO MUCH TO BE EXCITED ABOUT! Lucky you, my husband's whole day is ruined if his team is not doing well. He gets mad at the players personally. I can't sleep at night...I mean the man is like one of those annoying fans that thinks he knows more about how players should be playing than the coaches. ;) As for me, its just a good day to binge on appetizers. super bowl is not too big in canada but we have something similar with hockey season! every one just go to the pub and watch together, get ready to be drunk even on work night! yikes! The food is the best part of Super Bowl parties. Well, that and all the great commercials on TV. I love your post. My boy and my friends love football, but I just enjoy the commercials. Thanks for sharing. I don't watch football either but the boys at home do. I think I've gotten used to it all, but I feel so blessed they aren't big babies that throw tantrums when something goes wrong! Lol. I am not a huge football fan, meaning I know nothing about the Superbowl but these tips kind of help me out with that. I am in it for the halftime show and the snacks. What can I say? I am blessed with a husband who doesn't give a rat's patootie about sports at all :) I know quite a bit about the rules of the game, because my dad was a jock and played in high school. He was also a baseball player, so I know those rules as well. And I know about boxing - but I don't follow any sport. However, if I have to go to a superbowl party, I am versed enough that I know what's going on. I totally agree not all of us shared the same excitement when it comes to super bowl esp. when your team you are rooting for is not playing. But its always nice to gather with friends and eat food haha! ahahah such a fun post. We don't have the superbowl in the uk so nothing to worry about on my end! I would rather read a book than watch super bowl but I would like Patriot to win ha ha. I am not sure if the men at home will watch it. I'm not into football either. I usually just pay attention to the food, which is how I ended up missing the Janet Jackson wardrobe malfunction, ha ha. I had to laugh at the football meme. I really just don't care anymore! I'm usually tired after all of the cooking and I'm not a big football fan. But if I watch the Superbowl its for the music and commercials; however, I do love your tips. This is so funny. I love it. I am one of those people looking for ways to get out of staying the whole time. This is hilarious, and I can relate! Just yesterday my coworker was like "Who do you want to win the Superbowl?!" I don't even know who's playing! OMG YES! This is so hilarious! I mostly gravitate towards drinking wine with the girls that are there and eating + chatting about woman things while the men do their thing! I can NOT believe This Is Us is airing after! So WRONG! What kind of foods do you like the most? I love me some guacamole! Not really into American Footbal so I'm not too affected by the Superbowl craze. I watch tennis more as it is my favorite sport and of course, food channels! I've always been grateful my husband didn't follow sports. I'm glad to know I'm not the only one on the planet who doesn't hold down a couch in front of the TV on Super Bowl Sunday. I enjoyed reading your "About Me" so much I just downloaded your book. I'm not a big football fan, but my friends are so I always end up at a superbowl party NOT watching the game lol. I guess being around friends and people i enjoy makes the experience a lot better. I don't really watch football. I might catch a little bit here and there but I used to only watch the Super Bowl for the commercials. But you can see those on the internet. I let my husband watch in peace. 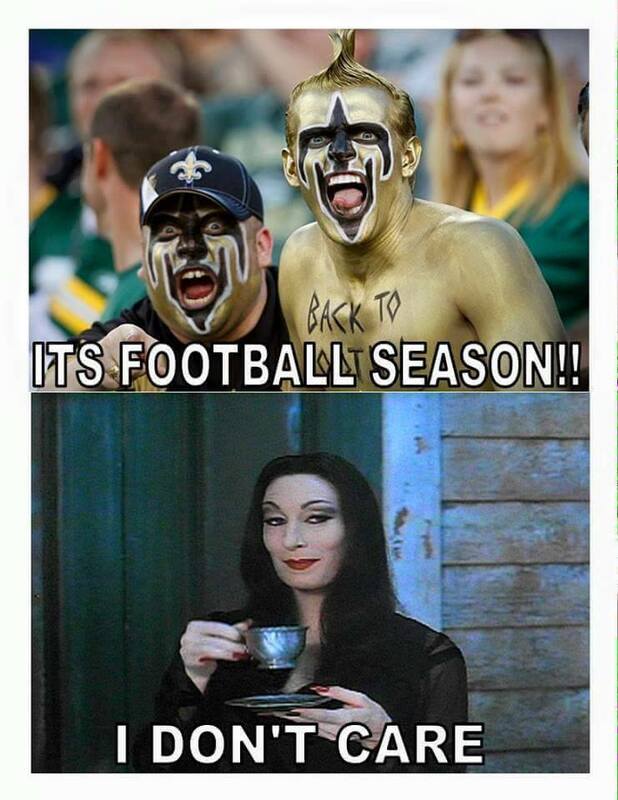 BAHAHA I really don't care about football, but yes to the food and commercials!! I absolutely love number 4!!!! That is exactly what I did the entire time. I just kept asking when it was going to be over so This Is Us could come on! I also enjoy the food of the day as well! 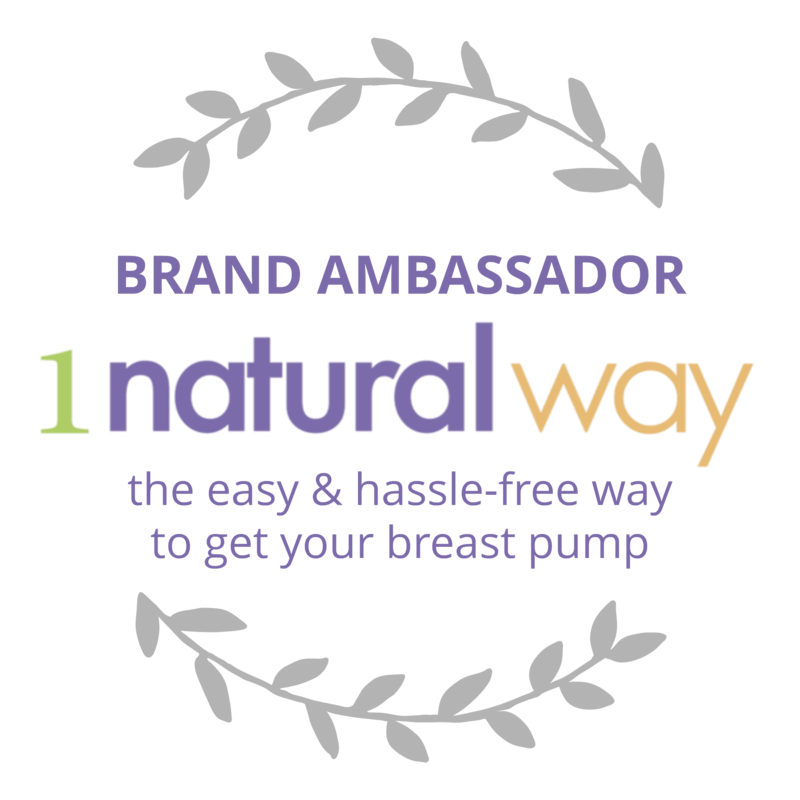 Awesome tips, thanks for sharing! Haha, I love this so much. You're right, even if you don't like football, there are some upsides, such as the food! We do a pre-football party. We have some friends who don't care about football. We do the appetizers and food before. They go home and hubby gets to watch the game with plenty of food still available. Everyone is happy. girl sometimes im only there to watch the commericals ha- they can be SO good or so bad so im praying they are good this year! I'm a Patriots fan so I'm super excited for this year's game! I'll be paying close attention to each play by play and the whole game itself. I tend to look forward to the commercials during the SuperBowl though my son and spouse typically watches the entire game. We are having a Super bowl party. We live in New England & The Patriots are Gods to every one coming. I hate football & am planning on staying upstairs most of the time with the kid. They'll have the puppy bowl & kitten bowl on. It's either be downstairs with football turned all the way up & surround sound & everyone screaming or be upstairs with the kids screaming. I'd really like to hide out in my office & watch You tube, but I feel rude. I have read magazines (reading a book is hard because you can't concentrate with everyone screaming). I have also been known to paint my nails. I hate the commercials & I hate the halftime show too. The only good thing to me is the food. We'll have homemade calzones. I guess I am lucky in the UK as we don't see much about the super bowl. I've heard there's a puppy bowl too though? I could get behind that. Where I'm from football is the most popular sport. To be honest I'm not into any kind of sport but I do watch ice skating from time to time. I Just love their costumes! I'm a huge football fan, so enjoying the game itself is easy for me. That being said, I definitely still make a big deal about the food and commercials. I have never gotten into the Superbowl really. But I do enjoy all the snacks and the commercials. I'm not a huge football fan, but I have found myself getting really into games on occasion. Depends whose playing. I would love to Super Bowl party with you! I think we would have a grand time. I like to do kareoke really loud during the super bowl. and pig out. I only like the Super Bowl for the half time show! LOL!! I don't care about football anymore. I have watched for two years and got tired of it. I don't like football. But sometimes I like the atmosphere of these kind of parties. It depends on the mood! Haha!Good enough, I love football so I wouldn't be bored watching some games in a super bowl party. Although next time, I'm going to be for the team everyone's against! Yup, I think I would totally bring a book too - and no shame! It is just something I am not really that interested in but my husband is. Honestly, I could care less who wins. I'm just waiting on the food. Wings to be exact. Show me all the SPICY, BUFFALO WINGS! I love all these ideas. My team didn't make it this year, so I don't mind who wins this one. I'm more here for the food and the commercials! HAhahah this post had me ROFL. I make the food and stay tuned for the half-time show! That is all! I love your suggestions! Me and my husband is a huge lover of football. I love your ideas here. Not rooting for either of the teams this year but still will be tuning in to see how the game goes. Never been much of a fan of the half time show but always enjoy watching the TV commercials. Though it seems they haven't been as good the last couple of years.